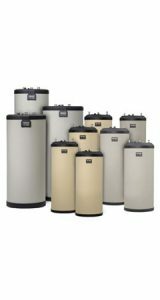 Weil-McLain® high efficiency indirect fired water heaters produce twice the peak flow of a tankless coil; at least 50% more than a comparably sized direct-fired gas hot water heater; and three times as much as an electric unit. Weil-McLain® high efficiency indirect fired water heaters are constructed with durable, corrosion resistant stainless steel. Their self-cleaning design resists liming.